New campus construction is about the exchange of ideas. 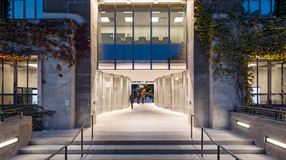 The University architect explains the theory behind the practice. Astrophysicist Josh Frieman, PhD'89, studies the night sky for insight into the accelerating expansion of the universe. New Rhodes Scholar Samuel Greene, '14, plans to study renewable energy technologies and climate change at Oxford. Investor David Booth, MBA'71, leads a sophisticated strategy to solve the looming retirement-income crisis. UChicago Medicine's Ravi Salgia says the disease's connection to tobacco use stifles funding and makes even nonsmoking victims the subject of condemnation. Adam Davidson, AB'92, discusses the difficulty mayors have in decreasing income inequality in New York. Law professor Eric Posner predicts more ideological extremism on the federal bench as a result of the Senate's rule change. Undiluted Hocus-Pocus is an "agreeably rambling autobiography" by the late Martin Gardner, AB'36, who delighted in puzzles, tricks, and debunking frauds. 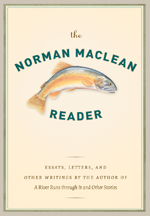 Visit the University of Chicago Press's website this month to get your free digital copy of Norman Maclean's [PhD'40] essays and letters. Take an inside look at the University's Center for Early Childhood Research. Have an iPhone? Use an iPad or Android tablet? With the Magazine's free app, you can take the latest issue with you.